The story behind car marques and the trademarks that define them. They are almost always easily recognizable with just one glance. What am I talking about? Car logos and emblems, “symbols” that tell you what a car brand is, usually without words. Every manufacturer has them with some maintaining their logos and emblems for decades without nary a change. Others, like Oldsmobile, went through multiple changes across its 107-year history, which may explain in part why that once storied brand is no longer around. It would be nice to have a collection of stories about some of our favorite logos, would it not? Well, Simon Heptinstall, an author, broadcaster, writer, editor and blogger, did just that. I was presented with a review copy of, “Car Marques,” and learned much about the history of some 90 such designs and much more. 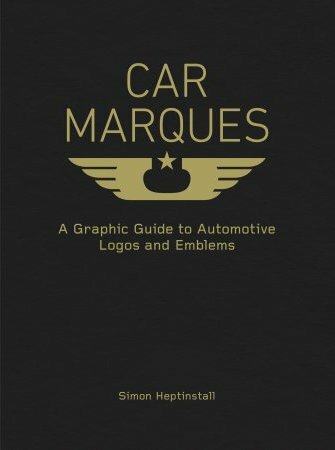 Published by Motorbooks (Quarto Knows), “Car Marques” is a soft-cover book with a suggested retail price of $19.99 and is available through most bookstores (224 pages; ISBN: 9780760362457). Heptinstall painstakingly went through all of autodom to look at most of the logos in use today or at least within the past 20 years. Mercedes-Benz, Chevrolet, Hyundai, Volkswagen, Ford and Toyota were among the current brands featured. Recently retired brands such as Pontiac, Rover, Mercury and Daewoo were also mentioned. Even then, Plymouth (retired in 2001) did not receive a mention, while DeLorean (retired in 1983) did. Marques of antiquity, such as Pierce-Arrow, Packard and Duesenberg were not covered. But for the 90 marques Heptinstall did review, he was thorough in both his research and description. Indeed, “Car Marques” typically offers one page featuring the logo, the company’s founding information as well as the best-known models of each brand. He then spends another page giving us brand background information and explaining what the logo means. For instance, the three-pointed star representing the logo for Mercedes-Benz is recognized the world over. The company traces its origins to 1886, when Karl Benz developed the first gas-powered car, the Motorwagen. Parent company Daimler had the star first, but when Mercedes-Benz was formed following several mergers, the circling ring was added in 1926. And it isn’t just any star you’ll see. Indeed, it has a three-dimensional look, which gives it the “richness” we expect. As much as I’m steeped in all things automobiles, there were a few brands mentioned that I never heard of. For example, Perodua is a Malaysian brand founded in 1992. In fact, it is the country’s largest automotive brand, ahead of the better known Proton marque. The company utilizes an unusual P symbol and offsets that with hues of red and green. A silver shade cuts through the middle to form the letter and also surrounds the logo. Color choices are so particular that manufacturers adhere to the six alphanumeric digit hex color code to define the “real thing.” You’ll then find logos fixed to the front of the vehicle and sometimes to the sides and rear. Inside, logos typically are on the face of the steering wheel. We’ve also found logos in puddle lamps, on seatbacks and, of course, in company documentation and advertisements. Logos and emblems aren’t the only subjects of this book. The author dug deep to give us back stories on some of the best-known names in the industry. No, not just brand names, but the individuals who founded these companies. In one example, we learn about the entrepreneur William Durant, who was a pioneer in the US auto industry. Durant accumulated riches through his Durant-Dort Carriage Company, funds he used to acquire the struggling Buick Motor Company. Durant eventually gained control of GM, founded Chevrolet, got booted from both and eventually left the industry. Always an innovator, Durant saw how bowling alleys were the trend of his time, providing families with an affordable recreational pursuit. Alas, Durant died in 1947, just as the trend began to set in. What about your brand? Do you know when it started and what are its most popular models? As for the logo or emblem, do you understand why it was used and what it means? These are the kind of questions that should draw you to “Car Marques,” to uncover the mystery behind the vaunted trademark. Logo photos copyright Auto Trends Magazine. All rights reserved.